On May 10th, 2005, the Carolwood organization and John Lasseter had planned a special treat for the beloved Ollie Johnston. 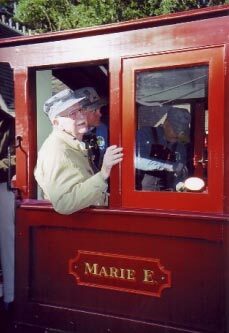 They wanted to give Ollie an opportunity to once again ride his treasured full sized locomotive the “Marie E”, lovingly named for his wife Marie. Ollie had rebuilt the “Marie E” in his driveway in La Canada-Flintridge and moved it to a track on his property in Julian, Ca. that he and his sons had constructed for it. Ollie sold the train to John, around 2002, when he was no longer able to operate it. John had the train expertly rejuvenated, and moved it to his own track in Northern California, where he gives it the same care as Ollie. John had gone to the Disneyland people, who at first denied the idea of putting the “Marie on the Disney track in the park. (The trains were the same gauge). Being someone who was not willing to take “no” for an answer, John put his legal team on the problem. They came up with an insurance loop hole, which said props from a movie could be displayed, but only employees of the that company could touch or ride the prop. At his own expense, John had the train trucked from northern California to Disneyland. Friends of Ollie's, along with the executive team at Disney such as Michael Eisner, and soon to be chairman, Bob Iger, as well as Howard Green signed a contract making them Pixar employees for the day at $1 each. The premise of the ruse was that the Carolwood group was going to honor Ollie for his contribution to the organization. The train was secluded in the tunnel by the New Orleans Square station. 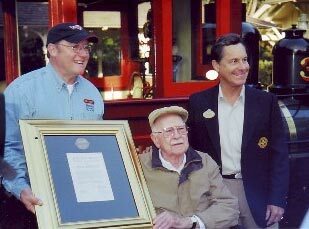 Ollie, who was 93 at the time, was really surprised as the “Marie E” pulled into the Frontierland Station. Friends gathered, including the wife and family of his dear friend and collaborator, Jeanette and Ted Thomas. Missing was Ollie’s own wife, Marie, who sadly passed away less that a week after this event.